A few weeks ago I was contacted to give some tips for learning online. I was fortunate enough to have three of those tips included in the article titled 101 e-Learning Tips from the Experts. My tips were included in the section Study Tips for e-Learners, Tips for Online Student Engagement, and General Tips for New e-Learners. The purpose of this article wasn’t to talk about my inclusion in this article or just to provide the tips again, I wanted to explain a bit more on the why I gave those tips and how I came about them being important to me. I formulated this process with the help and influence from several people. Watching what they were doing at conferences on Twitter and how it was helping me made me think about how else it could be helpful. The first opportunity I had to apply my new process was at a small, half day conference where I was able to enjoy the presentation and workshop of Jane Hart and Harold Jarche. You can still find my original reflections and a link to my Tweets from the day in this article. I still recall some of the major points and activities from the day because I was able to Tweet about it as it was happening. Not only that, but a month later I reflected on all these Tweets and compiled them into my reflection article which gave me another touch point with the material. There are added benefits though! Just as I’ve been able to benefit from conferences I didn’t even go to through others live-Tweeting them, I can do the same for others. Note taking by live Tweeting which forced me to synthesize the presentation and not taking verbatim notes. Reflecting on the material and putting it together in something that’s more meaningful to me. Put it into a permanent blog post that I can now search and refer to at any time. Others were able to benefit from the event through my live Tweets. Those are the benefits I can think of from this process, but I’m sure there are others. I’d love to see how you’ve benefited from a similar process, or if you’re planning on using it. I had to learn about this one the hard way, but am thankful I did. My hard lesson learned came from taking several MOOCs and finishing only one. Even though I finished the MOOC, I don’t think I got as much out of it as I could have or should have. I didn’t have anybody to talk to about what I was doing in the MOOC nor did I work with anybody else on any of the assignments. Humans are social and we learn to do things better together. MOOCs are no different, if you try to go it alone you won’t benefit nearly as much, and your chances of not finishing increase. It was by chance that I learned a good lesson on how to effectively learn in an online course (whether it be a MOOC or not). I was invited to a Google Community for a marketing course I had taken on Coursera. This put me in touch with several other people taking the course who were active in discussion and asked questions too. Not all social in learning is created equal though. I’d previously had encounters with the Coursera official discussion for the course, but it’s overwhelming. It was important for me to find a small, active group who would keep me engaged and accountable for the course. This group will help you do your best and it’s nice to see the different perspectives of each person. We even met through Google Hangouts and had one meeting with the instructor to ask our questions. It was a unique experience and kept me engaged with the material until the end. Have you taken a course where you found it hard to stay engaged and motivated to finish? This one plays into the previous piece of advice a bit. While it’s not reliant on it, a group of others could be exactly what motivates you. Your group may motivate you also, but isn’t your main motivator. Your goal may be to develop your skills at your job, or perhaps to add more credentials to your LinkedIn profile. The point of this tip is that you should never take a course just to take a course. You need to figure out in the beginning WHY you want to take it. Make it personal, make it important to you, and write it down so you remember why you’re doing it. 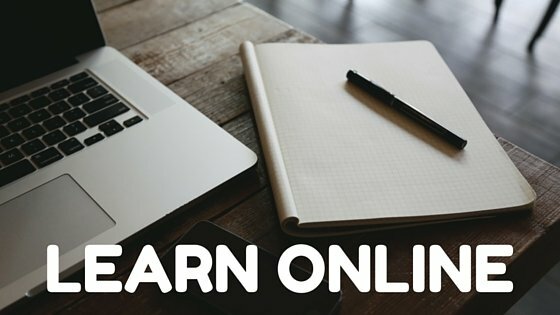 I’d love for you to add some of your tips for learning online. Please put them in the comment section because I know even for an “expert” such as myself (I don’t believe in the term expert if you’re wondering why the quotes), there’s always something to learn and better ways of doing things.